Imagine you're sitting at the board and you're faced with this position. Next, imagine you have Black and are about to play your 14th move against an opponent rated around 170 BCF (2100 elo equivalent, give or take, for our international readers). Imagine you have a crystal ball and therefore know you will secure victory in 13 more moves. Finally, imagine you're Robin Haldane and therefore not quite like other men. You have, shall we say, your own unique (and highly effective) style. So what are you going to play? If you'd like to see more games from what seems to have been a very successful event, then check out the tournament's website, which in fact features a lot more besides: votes about the structure of next year's congress, a message board, photographs, results, and news of their upcoming events. Who knows? Next time, it could be you in the prizes. PS. There's also a report in The Daily Telegraph chess column today. Like many expatriates who become accustomed to the proper pronunciation of a different language, I often find myself wincing when I hear English renderings of Spanish names. Zaragoza, for instance, is frequently mangled - the z is th - even on announcements at its airport. I must have heard the name Ballesteros hundreds of times on English television and radio without realising that the ll sound is more like a English y (think Mallorca). I put most of the blame for this on Peter Alliss, who I propose to refer to in future as Peter Ayis. It should be easier, I think, for an English person to pronounce Spanish words correctly, than the other way around, given that one of the languages is phonetic and the other is not. At least if we're provided with the right spelling, we shouldn't have to guess, as the Spanish are obliged to when confronted, for instance, with an English word that ends in -ough. As it happens, I have a very difficult name to pronounce, because the dg sound which we use for j is absent from Spanish and the h is always silent. I never know whether to introduce myself as Justin or as Hoostin and I usually end up saying both. People probably assume my real name is Justin Justin. But I digress. It's not just Spanish words that English people commonly mispronounce, for no better or worse reason than that nobody's ever told us the right way to do it. The Spanish language, as I suggested above, has an advantage over English in that respect - there are clear rules for pronounciation, including which syllable is to be stressed, and if a word exists which does not obey the usual rules, then they insert an accent to tell you that. For instance, a word that ends in a consonant, other than s or n, should normally be stressed on the final syllable - like ajedrez, for instance. But sometimes it's not: which is why there's actually an accent in Ruy López. And there is, apparently, an accent when Topálov appears in Spanish. Which is news to those of us who are used to pronouncing it TOP-a-lov, i.e. with the stress on the opening syllable. Nor is it good news, since unless they are getting it wrong then we have been mispronouncing the name of the erstwhile world number one and quondam FIDE World Champion for more than a decade. But what is the correct pronounciation? Topalov's Wikipedia page - the one in English - tries to tell us, but even if I understood what it was trying to tell me, Wikipedia is not so definitive a source that I'd take its word for it. (It doesn't help that his Spanish page omits the accent.) Meanwhile the influential contemporary authority "somebody on the internet" reckons (first comment on page) that the stress is indeed on the second syllable and is then almost immediately corrected by the next poster but one. So I tried emailing VeselinTopalov.net for a definitve opinion but as yet there is no sign of any assistance from that quarter. TOP-a-lov? To-PAL-ov? Toe-PAL-ov? Or something else entirely? I do not know. My phrasebook is of little help. If any readers are able to give, or direct me to, a definitive opinion, I would be glad of it. And then perhaps we should ask ourselves how many other chessplayers' names we are in the habit of mispronouncing. For who knows how many others there may be? "A dour battle" was how Captain Richard Tillett summed up my recent victory with the black pieces over Dulwich's Allen Miller in the Croydon & District Chess League Division 2. And indeed, I can't deny it: a long manouvering middlegame, a slight advantage, a simplified position with some pressure, a tight bishop and pawn endgame - that I scraped through to claim the whole point. Still, even the greyest of chess skies can be pierced now and again by a spectacular dart of starlight, and analyzing the game after my computer found that both my opponent and I had overlooked a remarkable possibility, which is the basis of today's puzzle: In this position from the game it's black to play. The wayward position of the white monarch might be exploited immediately with 49...Qf5+, for after 50.Kg2 Qe4+ black picks up the c4 pawn - although one would think white would retain reasonable chances of a draw. The same is also probably true of the endgame arising after 49...h5 if the game continues, say, 50.Qf4 Qxf4 51.Bxf4 Bxf2. Alternatively, black can consider the more ambitious 49... g5 with the immediate threat of 50... g4+ and a mating attack. Today we're due an update as to S&BCC's recent fortunes in the Surrey and Croydon Leagues. However, since Tom is currently walking up hill and down dale I've been left minding the shop so we'll put League news on hold for a day or two (sneak preview: we'll be glossing over the Croydon League I's recent trip to Coulsdon). So what to fill the gap until TC gets his yomping boots off? It occurs to me that the S&BCC Blog likes nothing more than a pedantic discussion on the definition of some chess term or other. Well my little corner of it doesn't, and judging by the disapproval my use of the term zwischenzug attracted, I am not alone. We might also recall Justin's more scholarly look at Zugwang back in November. In this spirit, then, who's up for a pointless investigation into what a combination actually is? 1. Coordinated action of two or more pieces. 2. Forced aspect of the variation. 3. Presence of a sacrifice. 4. Positive aim of the operation." I don't have a problem with 1, 2 or 4 but what's 3 all about? It seems CJS Purdy shares my doubts and has argued strongly that there's absolutely no reason that a combination has to involve the shedding of material . Edward Winter, in his wonderful book Kings, Commoners and Knaves, quotes Purdy's opinion then follows up with a couple of pages of debate on the question. My favourite argument against Purdy, from one Antonio Gude, is that the example given was not a sacrifice but a "logical tactical sequence". What's the difference I wonder. Surely, though, a combination is merely the linking together of two or more tactical themes into a single operation? Nothing more, nothing less. A combination wouldn't you say? A simple, even trivial one no doubt but a combination nevertheless. Hope I didn't put you off there ... but isn't Paul Merton supposed to be funny? It was a long drive, halfway across the country, and I got there just as the school day was ending and all the kids were walking home or getting on their buses. I hadn't seen Terry for quite a while and a mumbled "Hi Dad" while he looked at the floor was just about as much as I got. I started to say "how's your chess getting on?" but I'd only got halfway through the sentence when he stopped looking at the floor and looked straight at me instead, and it wasn't the sort of look that encouraged me to finish. Anyway, we went and had a chat with the head. It appeared that Terry had picked up the habit of setting light to things - the desk in the chemistry labs with a Bunsen burner, the prize-winning raffia work in the entrance hall, the kitbag belonging to the First XI, the skirt of the girl who sits next to him in English class. Or who used to sit next to him in English class. The head made it very clear, as of course he should, that the school couldn't tolerate this any longer, and I said I would use all my influence as a father to make sure that it didn't. "I'm sure you will, Mr Scorebook" said the head, and I was pleased to see Terry nodding vigorously as he said it. In fact he kept on nodding some time after the head had finished, clearly making sure he was taking it in. After the interview was over, the head asked Terry to wait outside for a bit while he had a chat with me. "Sorry to keep you back a few minutes, Mr Scorebook", he said after the door had closed and we had both sat down, "but we've not met before and I like to try and get to know the parents of as many pupils as possible. And Terry's never told us very much about you, though I suppose I can understand that." I didn't understand that, but he carried on. "Anyway, in the circumstances I suppose you haven't had as much contact with Terry as you might have liked." "Of course", I said, "what with the divorce and everything". "Yes", he said, "that as well, I should think". "And the travelling abroad", I added. He looked confused, as if he had misheard what I'd said, or as if he hadn't expected it. Then he carried on. "Well, hopefully you'll be able to see him much more now, I hope. If you don't mind my asking - you are getting all the help you need?" I did mind his asking, as it happens. "I've never asked for any help in my life", I said. "Ah, of course not", he apologised. "I was under the impression that help was sometimes offered in these circumstances". I had absolutely no idea what he meant, and said so. "There's no help at all for people like me", I said. "I mean I might act as a second but I've never had one." We looked at one another. "Mr Scorebook", said the head, I have the distinct impression that one or other of us is mistaken about something. Can I ask - what do you do for a living?" "I'm a professional chess player", I said. "A grandmaster". "Oh", he said. "I do apologise. Clearly I had the wrong idea. You see, Mr Scorebook, that's not what Terry told us." "Is it not?" I asked. "Why would that be?" "Well", said the head, "I don't know without asking him. Normally the children are very proud of their fathers and like to tell everybody what they do. But sometimes, in a few instances, they don't. And they make something up instead. Which I suppose is easier to do if their father lives across the other side of the country and nobody's ever likely to hear of them." "But why would they do that?" I asked. "Well, ah", said the head, "sometimes they don't actually know what their father does. Sometimes, of course, they don't know their fathers at all. And sometimes, perhaps, they do know, but they find it awkward to say what he does. Or embarrassing. So they invent something for them. Something more glamorous. Or more respectable." He stopped, and for a while neither of us said anything. Then I asked. "More respectable. All right. So what did he tell you I do? Am I a lawyer? Or a doctor? A television personality?" 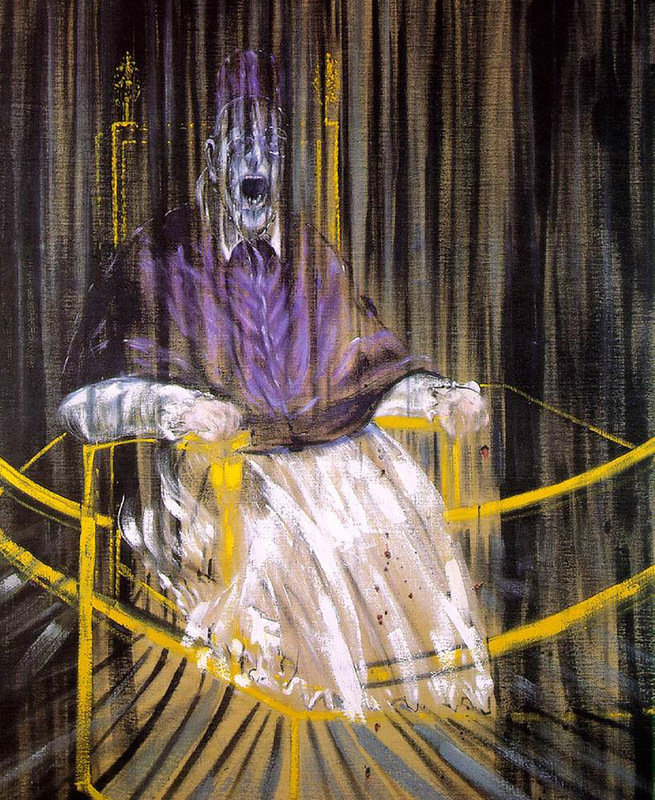 "I'm afraid not", said the head. "Terry told us you were in prison." I've been carrying this book around for a couple of weeks now but it was only a few days ago that I noticed the cover. How hard is it to see a move? Justin asked on Wednesday. Well, how hard can it be to see a picture? How hard is it to spot a transposition? 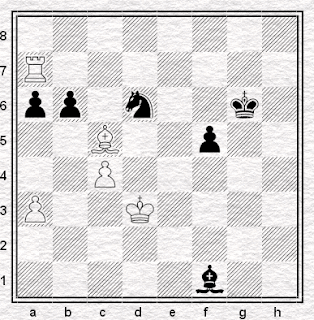 After 13...c5 White can of course transpose to the main line, Chapters 2-4, with 14.d5 O-O-O 15.O-O b4, but with (sic) 14.dxc5! Bxc5 15.O-O is a good alternative. Now Pedersen considers both 15...Bxg2 16.Kxg2 and 15...O-O-O 16.Qe2 good for White. More specifically, he describes the latter as "a favourable version of Line B22", which variant crops up on the following page and goes 13...O-O-O 14.O-O c5 15.dxc5 Nxc5 16.Qe2. 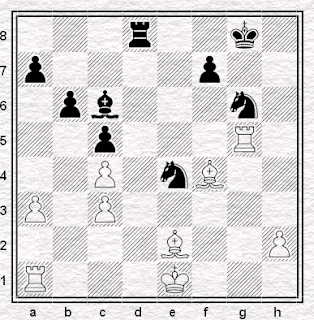 Oddly, though, in a note at Black's fifteenth he actually gives a game which proceeded 15...Bxc5 16.Qe2. Now as far as I can see, 13...O-O-O 14.O-O c5 15.dxc5 Bxc5 16.Qe2 gives precisely the same position - with precisely the same last move - as 13...c5 14.dxc5 Bxc5 15.O-O O-O-O 16.Qe2. It's just that in the second case the castling comes after the captures, rather than vice versa. Which makes it not so much a "version" of another line but a note within it. This is a little clumsy. Given that page 100 and page 101 are facing one another, it means in effect that Pedersen is giving a line on one side of the fold that he doesn't realise he's also giving on the other. 14.dxc5! really looks promising, as Black cannot follow up...Nxc5 with ....O-O-O for legal reasons. So it's all well and good, and next time, I shall know this: 14.dxc5 is the move to play and 13...c5 is not. But it does beg the question - why, if 13...c5 is inexact, does Pedersen, at the start of the aforementioned chapters 2-4, give the standard move order as 1.d4 d5 2.c4 c6 3.Nf3 Nf6 4.Nc3 e6 5.Bg5 dxc4 6.e4 b5 7.e5 h6 8.Bh4 g5 9.Nxg5 hxg5 10.Bxg5 Nbd7 11.exf6 Bb7 12.g3 Qb6 13.Bg2 c5 14.O-O - thereby missing, on several prominent occasions, precisely the crucial detail he is careful to point out later? How hard is it to see a move? 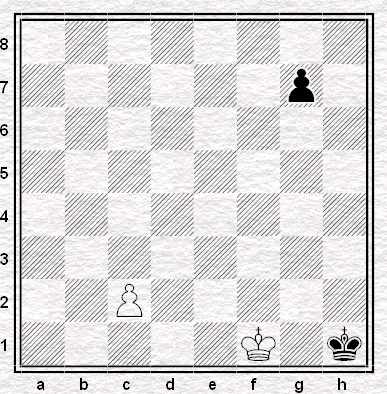 What is the best move for White in this position? The computer will tell you instantly, but you're not using a computer. You're on your own and you have two minutes to decide. Black's last move was 29...Qg3-c3. Let's insert a little illustration so that the answer isn't immediately visible to anyone who sees the diagram. The move White played - the move I played - was 30.Rd5-d2. 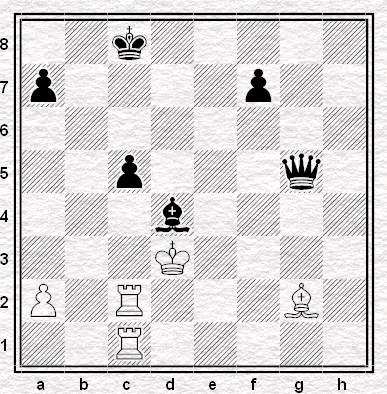 The winning move - very winning, since Rybka gets to +11 in less time than it takes to type it - is 30.e5-e6. My opponent saw it. I didn't. Didn't see it, didn't reject it, didn't consider it. Why not? It's an easy win. But does that mean it's a win easily seen? It's true, of course, that at the board there's no hint that you have a winning move at a given juncture. You have to find it - and then you have to make yourself sure of it. I should think that many or most players would consider 30.e6 in the position, provided it was presented to them as a puzzle. In other circumstances, many fewer would consider it and fewer still would play it. Moreover it's not just a question of having a heavy hint that there's a winning move available - when you attempt a puzzle it's open to you to speculate, to suggest that it might be such-and-such a move without being sure, to then look up the answer and find out. In a game you don't have the luxury of doing that. You're putting pieces en prise and opening up your king. You need to be pretty sure. Additionally, in this particular game there's the luxury of a safe move being present and obvious, that move being the one I played. In fact, it's more than safe, since it ought to win - though it was neither safe nor winning the way I played it, given that my thirty-first move threw away the win (31.Rc1xc2!) and my thirty-second, the draw (32.Kg1-f1). Are you going to play 30.e6 - maybe winning immediately, but surely losing if it doesn't - when you have the safe 30.Rd2 available? So, in two minutes - which is how long I had left - you need to see 30.e6. You also need to check it. To see that promotion is unstoppable after 30...fxe6 31.f7 and that the opening of the b8-h2 diagonal does nothing damaging to White's position. You need to check that Black hasn't got any tricks like putting something on d8. You need to be sure of all of this before you play it. And then you have to play it. an aggressive, attacking move when what you're thinking of doing is keeping it tight and not dropping a piece with your clock about to run out. Possibly that might explain why my opponent was able to see it while I was not: both of us were trying above all to stay out of trouble. Black because he was plainly on the brink of defeat, White because provided I didn't get mated or drop material I was plainly going to win - or so I thought. And in those circumstances you look out for your opponent's potentially dangerous moves, before your own. Or instead of your own. I wasn't playing over-cautiously in the game - I had, after all, sacrificed a queen. But I didn't think I needed to find something dramatic. And yet - it was a very easy win indeed. And maybe you have to look for wins as well as staying out of range for long enough for the win to make itself manifest. You don't just have to find, you have to look - and that's something I've never been much good at. Can this actually be addressed? It's easy, when looking at your games and your mistakes, after you find (or are shown) the wins you missed, to resolve that you will try harder in future and hope to see the win the next time. But you don't. I doubt that simply resolving makes the slightest difference. But how, then, do you do it? In the past few years, when I've been trying to improve my results, I've generally succeeded in doing so by managing to do less, not more. It is hard to add to your game, when you're in your forties. It is maybe easier, or better, to see what you can take away. To employ the capacity for self-knowledge to reduce one's tendency to blunder, to panic, to throw the game away, to see attacks where there are none. Less is more. Now maybe it would be possible, even so, to employ that same self-knowledge and declare: look, this situation recurs and recurs, and you know that you miss wins a lot at the climax of a game, when both players are short of time. So would it not be possible to look? To try and adopt a certain mechanism, a discipline? To start out, at least if there are a couple minutes left, by briefly asking myself - has my opponent let me in here? Do I have a win? I should. But even then, saying is a very long way from doing. And looking is a very long way from seeing. 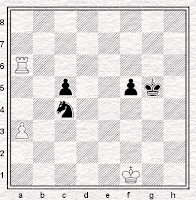 I suspect I shall be missing wins like this, far more often than I see them, for as long as I play chess. Two minutes is not a very long time to see a win: it's not a very long time to check it. And yet.... it was a very easy win indeed. How hard is it to press a clock? 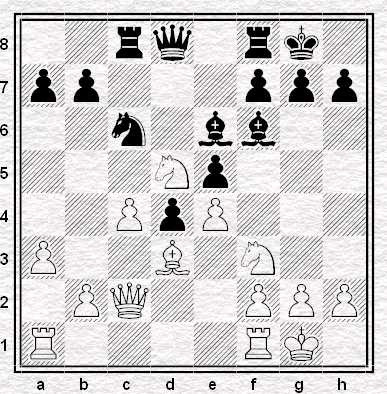 White had enjoyed a winning position just a little earlier but under the pressure of time trouble I had missed a clear win (spotted by my opponent) and found myself wondering if it would be possible to hold the resulting ending where White faces the twin problems of the passed f-pawn and the possibility of getting mated. We had just come out of a sequence of several consecutive checks, to all of which I had (unwisely) responded almost instantly, with the result that a clock position of less than a minute to go had been bumped up to, I suppose, three minutes or more. Anyway, I was starting to apply myself to the problem of how to save the game - despite my disappointment, we were 2-0 up in a four-board match and hence a draw would not be too bad an outcome. Specifically, I was looking for a fortress position and asking where my king should go. Perhaps the bishop should go to c4 and the rooks stay where they are, in which case the pawn can never promote...but if my king goes to b3 it'll be mated, so where to put it? I may not even, in truth, have got that far.....when my opponent pointed out that my time had expired (I was going to say, "my flag had fallen", but the clocks were digital) and I had lost on time. I had entirely forgotten about the clock. I had faced a series of checks in time trouble, the checks had ceased (perhaps my opponent's last move was clever in that respect) and I was posed with a problem that would take time to try and resolve. It didn't seem like time trouble, more a period of calm after the storm, like the allegretto in the Pastoral Symphony. Botvinnik once lost on time in a favourable position in one of his world championship matches against Smyslov. 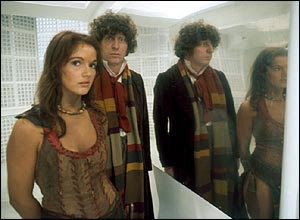 His explanation was that queens had been exchanged just before, the tension on the board had evaporated and it seemed to him that he had made the time control already, for those feelings are normally associated with passing the control safely. He had made 54 moves and the time control was on move 56. "It seemed to him that he had made the time control already, for those feelings are normally associated with passing the control safely." That was it precisely. Or nearly precisely. I wonder if, oddly, the fact that the Fischer clock gives you extra time also contributed to my downfall, since, having just been awarded several chunks of thirty seconds apiece to help my situation, I clearly wasn't in time trouble any more and therefore didn't have to worry about the clock. The funny thing (more funny now than at the time) is that one of my problems with Fischer clocks is that once you get short of time in the first place, you're always in time trouble. You never get that large wedge of extra time that you get using a conventional clock (if that be the term) when the time control arrives. So I also wonder whether I'm not still a little unfamiliar with the Fischer clock. My habits have been created and accumulated over many years using a different system - and as I still play occasionally with the conventional clock, so I still, in some way, expect the time trouble to end, and when I think it's ended, I expect to have a long think about what to do next. The game itself is an absolute tragedy. I'll get back to it in tomorrow's column. Here's Smyslov and Botvinnik. It's a year since I visited our neighbours at Streatham Library Chess Club, who meet between 3pm & 8pm each Wednesday at Streatham Library - so it's time for an update. And I'm pleased to say things continue to go well. The same friendly welcome awaiting any newcomers, numbers continue to grow, players continue to develop. Indeed at the time of our last report the Library players were in the middle of their first season of competitive chess, having filled the majority of boards for the Streatham & Brixton Chess Club team entered in the Croydon & District League division 3: Twelve months later and they have started their second campaign in convincing fashion, a team made up of captain Mel Rabain, Jori Lahderperi, Zornitza Chiderova and Barry Blackburn enjoying a 3 – 1 win over Crystal Palace. Having missed winning the league last season by just half a point, the team is ambitious to take the next step this time around. Their next two fixtures are away on March 5th & 13th but they are back at the tennis club for a home match with West Wickham A on March 18th. 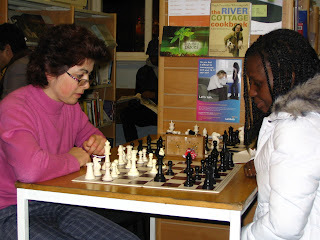 The cooperation involved in fielding such a league side is just one of a growing number of links between the library club and Streatham & Brixton Chess Club. A number of Library players took part in last year's Club Championship, as well as this year's Mid Season Rapidplay - see especially here. 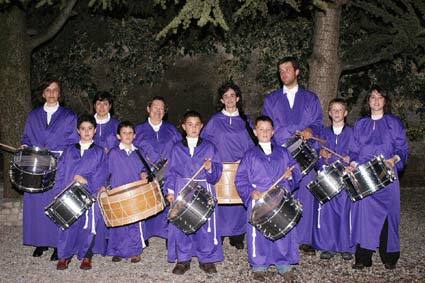 Many have become regular attendees at club nights. The library setup is achieving growth in its own right with numbers swelling and matches becoming ever more competitive. A former S&BCC member could finish no better than seventh in their 2007 Club Championship and their winter rapidplay tournament is now in full swing. It's a seeded, grouped event but the seeds are toppling and competition is fierce for the six coveted places in the top group for the second round. 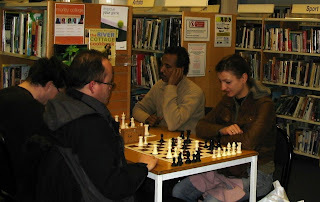 So, whether you're an established player looking to get more involved in south London chess, or a beginner who wants to play some chess in a friendly environment, you should check out the chess club at Streatham Library one Wednesday afternoon or evening. Thanks to Stan Rodrigues for his help in writing this report. You can also email Stan for more information about the club if you would like to. I seems like only last week that Wijk aan Zee finished but another one has already arrived. Like buses these super tournaments. Yes Linares has started ... well Morelia-Linares as I should get used to calling as the split venue format seems to have become a regular feature now. Either way, the tournament has a got a fairly tasty line up and with three decisive results out of four games in round one (including Anand winning with Black against Shirov) there was no shortage of action to kick things off. I'm sure we'll be giving it a mention or two while it's on. You can also follow it on the official site or perhaps you prefer my new favourite chess site Chess Vibes and no doubt a gazillion other places too. By the way, the Vibers have put a poll on their homepage asking who people want to win the tournament. When I last visited Magnus Carlsen was way out in front snaffling 35% of over 1,200 votes cast. Very popular this Norwegian lad. UPDATE: 2nd round news ... Aronian beats Anand with the Marshall Gambit, Ivanchuk beats Leko. Details at ChessBase or Chess Vibes. The Linares tournament has been right at the top of the chess world for a couple of decades now. Years before the Sofia rules were dreamed up, tournament director Luis Rentero tried to make sure the players fought every game. In 1992, for example, he decided to include clauses in seven(*) of the players' contracts that they would not agree draws before move 40. It seems that the eighth round contained several draws that displeased Senor Rentero. Even though neither Salov nor Anand could have avoided their repetition without losing, and even though Gelfand-Yusupov was considered to "one of the most spectacular games" (New In Chess, 1992/3) the tournament had yet seen, they both had ended prior to move 40 and thus were prohibido. "... the next morning seven players received a letter in which they were informed that one hundred thousand pesetas (one thousand dollars) would be deducted from their bonus. 'You are the most honest man I know. As long as I live you will play in Linares.'" (*) Why just seven and not them all? I've no idea. I was drafted into the Croydon League to play at Coulsdon on Wednesday. It was, shall we say, not a successful journey. After a comprehensive gubbing at the hands of former S&BCCer Kevin Bailey I was nosing through their collection of second hand books when I noticed they had a copy of Edmar Mednis' From the Opening Into the Endgame available for sale. That's worth a pound of anybody's money I thought. As it turned out I didn't actually have any change on me (students eh?) so it was a quid borrowed from Martin Smith that I gave them for the book. One of the reasons I wanted to get the book is the chapter based around the position at the top of today's blog. It has always greatly amused me. Precisely symmetrical other than the position of the Knights. Can White really convert a two tempo advantage (one of which Black will automatically get back seeing as it's his move) into a win? Well it turns out he can - if White is Smyslov or Andersson that is. This, it seems to me, is an example of how chess is such an impossibly difficult game. The price of nearly equalizing (almost literally in this case), but not quite, can be an eternity of defending a worse position without a hint of counterplay. I hadn't played the Black side of the Nimzo-Indian for more than two years. Partly because nearly everybody (except for me) seems to play 1.e4 now, partly because, after the last time, I spent some time experimenting with 1...d5 on the grounds that I like to play more solidly against stronger opponents. Among my reasons for returning to the Nimzo is simply that I hold it in such high regard. For me, it's the best opening for Black there is. 4.Qc2 O-O 5.a3 Bxc3 6.Qxc3 b6 7.Bg5 Bb7 8.e3 d6 9.Ne2?! This isn't much good: it's too slow. 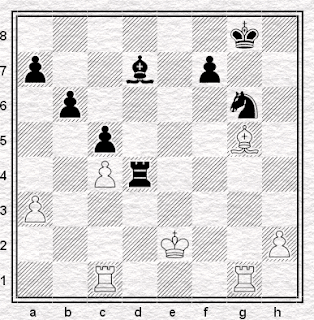 White needs to deal with the b7-bishop either by putting the knight on f3 or by playing f3 and Bd3. Black is fine here and although, immediately after exchanging on d4, I thought I should maybe have waited with 12...Re8, it's OK as it is. 12...exd4 13.Qxd4 Ne5 14.Be2?! c5!? White criticised this move after the game: I think I'd stand by it, although it may not be the best, Black is still doing OK. 14.O-O-O is probably better than the bishop move. ...as it happens, Rybka doesn't like ....g5 when it's finally played, and although fickle, it's probably right. Play might have continued instead 15...Bxg2! 16. Rg1 Bc6 17.Qc2 Ng6 and not only is White's compensation for the pawn less than clear, but it's the sort of position I'd be happy defending. I don't remember considering omitting the move of the g-pawn: I wish I knew why. 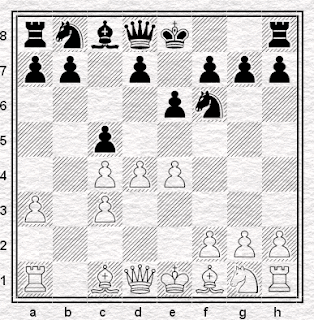 I'd realised a few moves back that I was going to have to take this pawn, opening up the g-file in front of my king. However I decided that I might have good practical chances based, partly, on the uncastled white king: and one might as well have a pawn as insurance. Somewhere round here, my opponent - who speaks very quickly, far too quickly for me to follow - asked me something. I didn't understand, so he asked me again - and again. Eventually, our board two, who speaks a little English, said "in the middle of the squares" and I realised he was just asking to adjust his pieces. 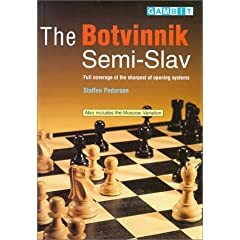 I have a little book on the Linares 2003 tournament which I've used to try and teach myself Spanish chess terms: but I never thought of this one (and I can't, to tell the truth, remember it today). Possibly because I've always used the French j'adoube, which I thought was universal! This is where White misses a trick. Rybka points out 19.h4! If 20.h4 Re8 21.h5 Ne5, now that the f4-pawn is no longer present. 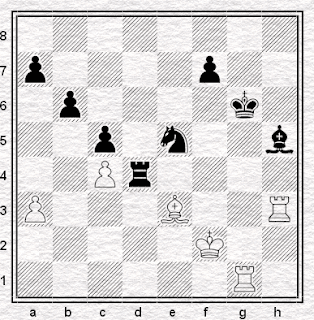 In the previous line Black would have been obliged to put the knight on f8, a much less powerful position. Its subsequent role in the game perhaps demonstrates better than any variations how much better this would have been for White than the game continuation. I think we both thought White was better here, with two Black pawns about to drop, but not only does Black get one back on e3 (restoring material equality) but taking the pawns puts White's pieces in vulnerable situations, of which Black can take advantage. Maybe 20.Qxd6 but after 20...Qxd6 21.Bxd6 and then a similar continuation to that actually played, Black seems to me to be perfectly comfortable. At some point, possibly round about here, the lights went out. I'm not sure, but I think they went out in the town generally and not just in the playing room. Some players got up, some stayed at the board, much like Fischer in Buenos Aires, until they were requested to arise. After a few minutes light was restored and play continued. Readers would be forgiven for concluding from the standard of play that the lights had never been on in the first place. Which brings us to the situation described on Tuesday. 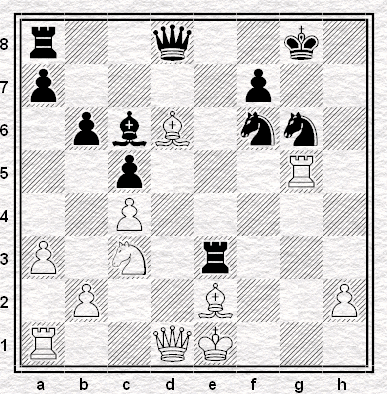 After White had evaded the ...Rxc3 trap, I decided to play it anyway, getting a pawn and compensation for the exchange. 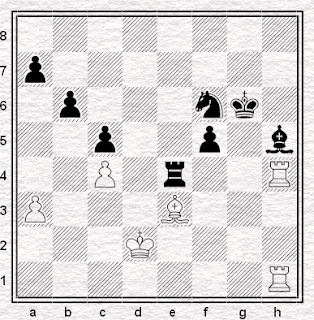 In truth this was both too optimistic and unnecessary: the rook could have retreated and Black would still be fine. Much better than 25.Rg4, after which 25...Kh7 creates the threat of 26...f5 and it's surprisingly difficult for White to save the bishop without giving back the exchange. 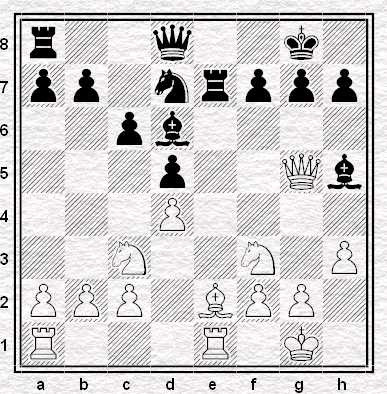 The move played allows the bishop to be defended from f1 if necessary and means ....f5 no longer gains a move. Black's fighting for a draw: but I'm not sure White realised this. At the time I didn't like this and preferred 26.Bh5 - which is also a good move, but no better. I think I'd envisaged getting my knight back to e4 and dominating the board from that post, but in truth it's not going to happen that way. However, the position's messy, and where it's messy there are always chances. I saw 28.Bb8! 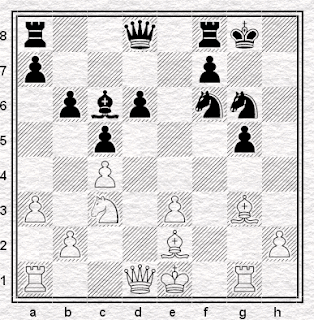 after which it's hard to prevent both White consolidating and taking the queenside pawns. At this point, as they say at Wimbledon, play was suspended. Not, however, because of rain. There had been a drumming noise from outside which had become increasingly disturbing, probably because it had become increasingly loud. This, in turn, was because it had come increasingly close to the playing room, which was above a bar. Indeed, the drummers had stopped in the street directly outside the bar, this being the place where they concluded their performance. Clocks were stopped and we went downstairs to watch them finish. I am far from sure how old the tradition is - which, apparently, seeks to recall the noise of the earthquake that is supposed to have happened at the death of Christ. (The sound of an earthquake is not generally considered to constitute normal playing conditions. Though there was the time I played at Bury St Edmunds early in November and there was a firework display outside.) They are mentioned in a sixteenth-century account of a visit to an Aragonese parish and it's clear that it was not a new practice even then. Given that modern chess was introduced to Spain not long before this time, it's possible therefore than Aragonese chess has been disturbed by tambores for the entire half-millenium-plus of its existence. I didn't much like my position when we left it: I thought I might be hanging on because I could try and attack the c-pawn, but in truth I shouldn't get time to do that. Fortunately, on our return my opponent chose a questionable plan. As yet this doesn't spoil anything, but only because, being too keen to get my king off the g-file, I didn't play 29...Bg4+! 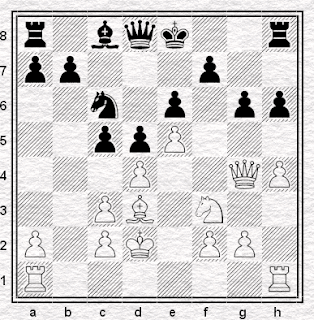 after which the knight comes to e5 and Black should be OK again. However, I think I'd decided that White had a further mistake in mind, and he surely did. 30.Bf6! probably wins, as 29.Bf6! would have done. By creating threats, White forces Black to remove his pieces from the present good positions, and thereby wins time and space to get his pieces into play. Now Black gets the second pawn for the exchange and his pieces are freer. He's probably not winning, yet, but it's a struggle for White, made harder by the knowledge that he's basically thrown the second pawn at Black without his opponent having to do anything to win it. It took a little nerve to play this. More importantly, it took a little time - Black now had only a couple of minutes left on the clock. If there's a point where White's position becomes lost, it might be here: at least 34.Bf4+ allows the bishop to go to somewhere like b8 and make trouble whereas from e3 it can only retreat or be exchanged. I am quite sure my opponent didn't think he was winning the rook: but he too was short of time, he was the one with a deteriorating position and he had to find a move, so he chose one. Very difficult circumstances. I was absolutely sure I was going to win this game now. And then I became unsure. Isn't the bishop on h5 a bit loose? Might it drop if the rooks get at it? Calculating variations isn't my forte at the best of times: with practically no time left (even allowing for our extra thirty seconds a move) my capacity to think concretely disappears almost completely. I can, often, stay out of trouble and avoid putting anything en prise: it's a way of avoiding defeat. But it's no way to finish off won games. 35...Rxc4! just grabs another pawn - there's no need to pin the bishop which isn't going anywhere. 35...Rd3 would also be strong. With time to work out the answer to the question how do I go about winning from here? I'd no doubt have seen both. As it was, I only had time to think of a safe move, briefly check it and then play it. But it's not spoiled yet. Now it is. 36...Rxc4 is still the right idea. 37.Kc3! 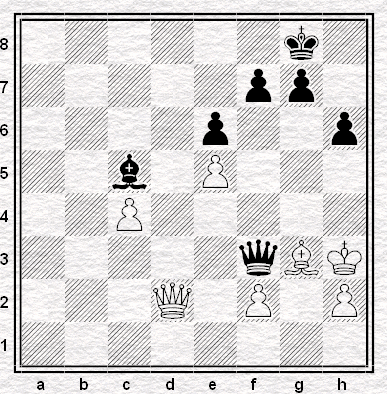 is the move, securing the c-pawn. 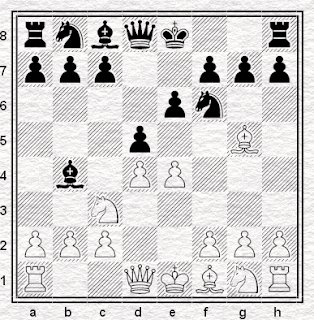 Black's kingside pieces can hardly move. Losing my nerve with just a few seconds left. 37...Nxe3 picks up at least one more pawn and with it, the game. There was nothing to be scared of in 38.Rxh5 as 38...Nxc4+ gets the a-pawn as well. In fact, if anything White is handicapped by taking the bishop as it means his h1-rook is temporarily tied to the defence of its colleague at h5. 38...Bf3! is still winning. 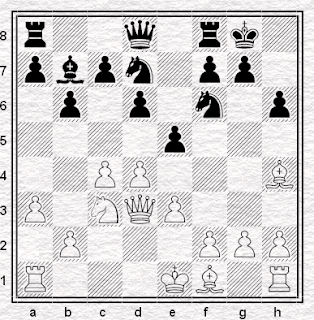 It frees the bishop from the rooks' attack, which means the knight can rejoin the fight for c4 (via d7 and e5). It wins time to do this by attacking the h1-rook and if 39.Rg1+ then it can drop back to g4 and the rooks are no longer doubled. It's often in the nature of games where wins are missed that they get gradually harder to see once you've missed the first one. The c4 capture is harder to see when you've already not played it the first time it became available: the bishop move is harder still, it being an aggressive, attacking move when what you're thinking of doing is keeping it tight and not dropping a piece with your clock about to run out. But now the win is gone and White has the upper hand again. This is exactly the sort of thing I needed to avoid. 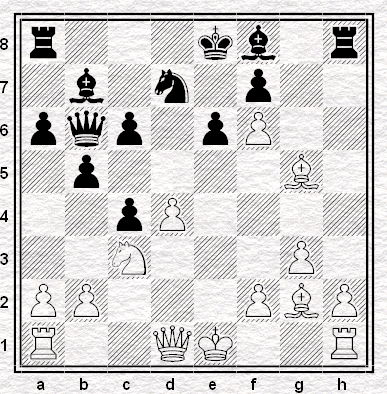 Now White's rook gets among the queenside pawns, while Black's passed f-pawn is curiously static. I'd been planning the blunder 42...Bg2 with the idea of 43...Bf1+, but fortunately I saw White had 43.Rg8+ with the idea of 44.Rxg1. But now Black's going backwards. Natural, but Rybka thinks White is winning with 43.Rg8+ first, as after 43...Kf7 44.Rd8 Black can't hold: either 44...Ne4 45.Rd7+ and the a-pawn falls, or 44...Ke6 45.Bf4 Nf7 46.Re8+ Kd7 47.Rg8, the point of which is that White will play Bb8 and Rg6 and win a pawn on the queenside. In fact Black has a bizarre means of escape involving 43...Be4+ 44.Kc3 Bd5!! 45.Rd7 Nxc4!! but who's likely to see that? I thought this was an error at the time (possibly because I still didn't appreciate that I was losing) but my preferred 45.Rxa6 isn't so good because the rook gets into trouble after 45...Be4+ 46.Kc3 (or 46.Ke2 Nxc4 47.Bxc5 Bxb7 48.Ra7 bxc5 49.Rxb7 Nxa3) 46...Nc8 47.Bxc5 Bb7 48.Rxb6+ Nxb6 49.Bxb6, when Rybka reckons White is about 0.60 better, and I do not. Now White has just a pawn for the exchange but the c-pawn must surely fall. Is he winning? He has all the chances, but if you want a definitive judgement you'll need to ask a better player than I.
and a draw was agreed, on nobody's particular proposal. I was furious with myself, afterwards, for not having won the game. But I cheered up a bit after I'd realised that I was actually losing at the end. Not a great game. Not even a good one. But a dramatic one, for sure. Chess, The Theatre, A Hospital - and . . . You Again? You might recall that back in November, St George's Hospital, Tooting, witnessed a rather unusual chess event: a theatre production called The Chess Players performed over three days, whilst patients, staff and visitors played friendly games with members of Streatham and Brixton Chess Club and Streatham Library Chess Club. We previewed the event here and then reported it after. The creative force behind that successful event was writer Sarah Weatherall of theatre-group Lightning Ensemble, and now she's planning to return to the hospital with an even more ambitious chess-based project: a week-long event running from April 21st to May 2nd which will include at least one session at a second site in Wimbledon, actors performing in public areas and the wards, all with a therapeutic ethos whereby chess is used to enable staff and medical students to relate to patients in different ways. And once again, the hospital staff, patients, and visitors will be invited to play chess games against members of our and Streatham Library's Chess Club. Which is where you come in! Each afternoon will feature a chess session of around three to four hours, and at the end of the event there'll be a match between ourselves and a newly-created hospital team. So if you have a couple of hours or more to spare, do take part. You can volunteer or find out more information by contacting Stan Rodriguez, whilst the Lightning Ensemble website is here. 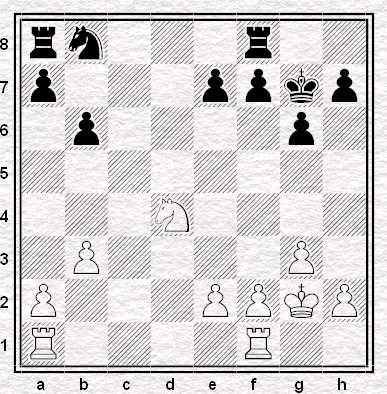 On his scoresheet White wrote down the move 22.Dd2 (i.e. 22.Qd2.) After considering the move for some time, and presumably discovering that it loses on the spot - rook takes on c3 and then knight to e4 forking everything - he erased it, substituted 22.Af4 (22.Bf4) and played that move instead. I was under the impression that you're not really allowed to do that, so I stopped the clocks and enquired. 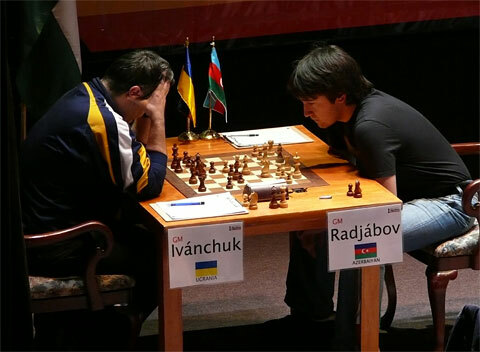 As it happened there was a FIDE International Arbiter in the room: he indicated that play should continue and so it did. The game ended in an exciting draw, accompanied by power cuts, language difficulties, and drums. I hope to to annotate it here later this week. 12.2 During play the players are forbidden to make use of any notes, sources of information, advice, or analyse on another chessboard. Now normally I'm sceptical as to whether, say, writing down 1.e4 before playing it is really the sort of note which most chessplayers would consider unfair or unethical - that would more likely be something like carrying your notes on the Tarrasch Defence in your back pocket and consulting them when you forget the theory. So when the rule change was introduced I was sceptical about it, considering it a clumsy means of addressing an unimportant problem and likely to cause more problems than it solved. I think this probably remains my view. However, it is the rule now, and if writing down the move before playing it may be considered to be making notes, then surely that is clearly so when the move is changed. So what action should be taken? What is the penalty, for infraction of the rules? Now "forbidden" seems to me quite a strong word. It means that you cannot do it. It appears, as far as I can see, seven times in the Laws: once in this instance, once in 12.2 as shown above, twice in connection with improper use of the clock, twice in connection with mobile phones and once in connection with distracting the opponent. In only one instance - that of a player's mobile ringing - is there any mention of a specific penalty (in that instance, the loss of the game). However, in nearly all cases, the reader is referred to 13.4, which offers the arbiter a range of sanctions, beginning with a warning and ending with a player's expulsion from the event. There are two exceptions. One is the use of mobile phones by non-players, to whom most of the available sanctions could not apply. The other is 8.1, dealing with the writing down of moves before they are played. Now we can, if you like, infer that 13.4 applies and that an arbiter should take action of some degree against the offender, for engaging in actions that are, after all, "forbidden". But it might be helpful if it actually said so. As for what those sanctions should actually be - the Laws, if you read the Preface, try not to be too prescriptive, quite probably correctly. But this being so, we would perhaps expect to be guided by precedent, and by custom and practice. So what penalty, or what action, should (and do) infractions of this rule attract? There has to be something, even if it is only a warning. There surely can be nothing more absurd than stating that an action is forbidden - and yet permitting it without penalty or warning when it actually occurs. Forbidden does not mean permitted: they are antonyms if ever I heard them. I would be interested in readers' experiences of this issue, especially, though not exclusively, readers with experience as arbiters, or with experience of the question arising in international tournaments with experienced arbiters present. What does happen? What should happen? And does the rule have any practical meaning? As far as I'm concerned, I wouldn't be distressed if they abolished it, but while it exists, it seems to be that it should be observed and that players and arbiters both should have some idea as to how this should take place, so that we can have a reasonable expectation of what will happen if there is an infraction. I don't care very much about what happened in this particular game, in which there was no intention to benefit the player or to distract the opponent, and in which the result of the individual game could not have affected the match. But I do think the issue should be explored, because it has come up before and it is going to come up again. In practice, is the infraction of the rule ignored? It's not the first time I've seen it ignored - in a tournament last year, an opponent did it persistently, after I had asked him not to, and then continued to do so even after I had asked an arbiter to observe - and the arbiter said nothing. Because if it is going to be ignored in practice then the rule should not exist. To me, a rule persistently unenforced brings the whole body of law into disrepute. Streatham and Brixton Chess Club's First Team has, without a doubt, had a season of two-halves in the London League - so far. The 2007/8 season began with a solid draw against a strong Drunken Knights team despite a default on board 4, but that was followed up with fine wins over Kings Head I, Kings Head II and most impressively of all over Cavendish I, who finished second place last year in the League. There were many moments to savour from these matches - from the consistent performances of Vekram Tiruchirapalli and Jeremy Leake on the top boards - frequently against titled players - to individual brilliancies such as John Carlin's miniature featured here. After that - our match against the currently-unstoppable Wood Green had the inevitable result, despite notable draws for Angus French, Jeremy Leake and Andrew Stone, against respectively International Master John Paul Wallace and Grandmasters John Emms and Chris Ward. Incidentally, Andrew's draw followed a particularly fine piece of adjournment analysis that we hope to feature shortly on the blog. And so the team ended 2007 with a more than satisfactory 3½/5. Hopefully the remainder of the season will witness a recapturing of earlier form: The team currently sits fifth from twelve, with three matches remaining, against Cavendish Seconds, and Mushrooms & Wimbledon Firsts. The Second Team by contrast have had a far tougher time of it. Newly-promoted to the Second Division last year, this was never going to be an easy season. And so it has proved: the team sit in a relegation spot, second from bottom in the league. And there's a reason for this: London League II is a seriously tough division. For instance in our recent match against them, Beckhenam & Charlton sported two FIDE Masters on boards one and two, and then outgraded us on every subsequent board. Another example: in our match against Richmond I, all of their top six boards had higher grades than our board 1. Still, the Fat Lady is not singing just yet. The team has one match point to their names from gritty draws against Athenauem and Metropolitan Seconds, and club Phoenix's curious score of -1 (thanks to the subtraction of penalty points from their ten-board defaults of two entire matches) provides a second glimmer of hope. With four matches left to go, all is certainly not lost. But if we look to the London League's new Under-120 four-board Minor Division, we can end this report on a high note. From their six matches, our team has won - six matches, and you can't beat that. Congratulations to them, and let's hope it inspires our two other London League teams to excellent performances in the remainder of the season. Note: we've decided to cover club news every two weeks on Mondays starting today. In two weeks time, we'll provide a summary of the season so far in the Croydon & Surrey Leagues. The S&BCC Blog quota of video clips for the week already having been filled by Tom's chess playing duck last Wednesday, you may want to hop over to Chess Vibes for a peek at their request for examples of music videos with a chess theme. Chess Vibes is one of those websites I feel I should really visit more often. Every time I do I think it's really good but never quite get around to checking it out on a daily basis. There's just not enough time left after all those wasted hours on doomed attempts to win games of scrabulous and tracking down amusing clips of what happens when an eejit gets hold of a large log (and when I say 'amusing' that's for the first 20 seconds or so only. The rest pretty much amounts to feckwit lying face down in the grass). Anyhoo, the Vibers were kind enough to credit us with finding Ray of Light but curiously they only found out about Rook House for Bobby during Corus even though we've had the I Like Trains video up in our Video Index almost as long as the Madonna song (both being published here early last September. I drew my game last Saturday. 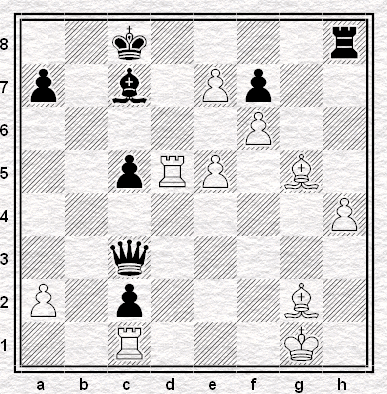 Higher graded opponent, Black pieces, equalised, symmetrical pawn structure, fourteen moves, thank you very much. It's the way I play: chess is an intellectual challenge and the way I make that challenge to myself is to see if I can get through the game without throwing it away. Moreover, if you avoid throwing it away, there's every chance that your opponent will step in and throw it away instead. Well, there are different views of this sort of thing, different approaches: there are those who will never offer a draw, at one end of the scale, and people like Bogdan Lalic (see round six commentary) and myself at the other. To some extent I view it as a psychological ploy. Offer a draw - especially if your opponent is a stronger player and especially if you have Black - and if your opponent turns it down, they are always subsequently playing under the pressure of having had a draw for the taking and having let it slip. Let it prey on their mind - and if they accept the draw, well, that's a good result anyway. Possibly. But possibly it's also a psychological weakness - the very fear of losing which it seeks to exploit in the opponent. It manifests itself in a tendency to offer draws in positions which are winning, or close to winning - because I've been too keen to ensure I avoid defeat to examine the possibility that I might, in fact, do better. The clock plays a role, for sure. But so do nerves, and the lack of them. Still, it is better to draw than to lose. But what does one do about the fear of losing? Isn't the fear of losing basically a fear of oneself? Today we're going back to my current favourite topic - the Exchange Variation of the French Defence and the fact that it's not necessarily an unrelenting diet of dullsville. "... as a matter of fact, Black will at least not have a fewer opportunities for complicating, if he wants to do so, than in most of the other variations of the French." To be honest, my opinion is probably closer to EJH than AA. In truth it's not always easy to generate an interesting game in this line and if we were to take Alekhine at his word we'd find as many famous Black wins in the Exchange as we do in the Winawer ... and that's just not the case. It's not all opposite side castling and hacking away (TIFE II) as I acknowledged in TIFE I.
Anyhoo, here a couple of more games from Victor Korchnoi who tended to be in a fighting mood whether he was faced with the exchange variation or otherwise. Tatai-Korchnoi, as mentioned by Mike G. in the comments to TIFE I, is another commonly cited example of Black's opportunities after 3. exd5. It's not typical of the line but definitely it's inspiration for what can happen if you give it a go. Kovacs-Korchnoi is also fun for Black, although sadly we can't rely on too many players of the White pieces coming up with Kovacs' queen manouevre on move 11. Next time, I might finally get around to answering Angus' charge that 3. exd5 is a 'shameful' move to play. That chess dishes out both creativity and cruelty in various measures is no secret, and it is during complications that we tend to witness most of each. Yet this fact is sometimes overlooked. We tell ourselves instead to practice our endgames to perfection, delve into opening ideas and their variations, study the classics of crystal-clear positional play - yet 99% of chess games are decided instead during the stage of complications. The stage where you realise you are getting positionally crushed on one side of the board, so lash out on the other; the stage where your opponent sacrifices speculatively and unexpectedly; the stage where the position becomes a giant, messy confusion; the stage where each flag quivers. The exception not the rule are the perfectly smooth games we dream of, and this is true to the very highest level. 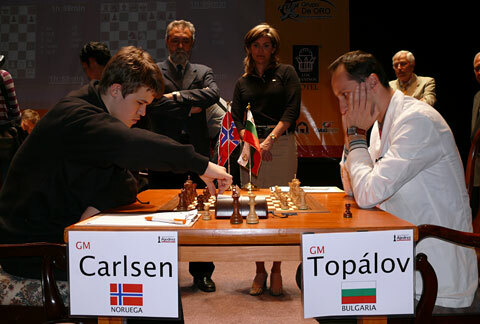 For an extreme example consider Loek Van Wely versus Magnus Carlsen from Corus 2008. At various points your computer will tell you white was +6 or more - but, black won . . . amidst wild complications. 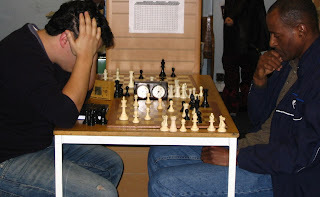 Which brings us on to this remarkable recent London League Division 1 clash between Streatham and Brixton Chess Club first-teamer Jeremy Leake & Ilford's Martin Taylor. As our board 1 Venkat Tiruchirapalli noted after, "the idea of bottling up the queen and then attacking e3 (instead of worrying about winning the queen) is, I hope you will agree, quite instructive." As is that this fascinating game was without doubt decided amidst almost-continuous complications! Enjoy. "Nobody remembers Alfred J. Kwak," emails blog reader and new Streatham and Brixton Chess Club member Morgan Daniels, "and this makes me very sad, for no other children's show that I've seen is so simultaneously sweet, dark and baffling. It was created by the famous Dutch singer/songwriter Herman van Veen, and followed the exploits of a brave young duck (Alfred), who lived in Waterland. In the second episode, his entire family get killed by a car (! ), and he is adopted by a mole named Henk. What sets AJK apart is just how downright mature the stories were: Alfred's arch nemesis, for example, was a Hitleresque crow named Dolf, who went on to front something called the National Crows Party. There were numerous references to Apartheid, too, and Alfred had a black girlfriend, Winnie (a nod to Mrs. Mandela). My love for this show is boundless. "Now, I recently remembered that in the phantasmagorical opening sequence Alfred played chess against Henk, and I was desperate to see if this came from an actual episode. Lo and behold, it does: episode 1.12, 'Alfred's Chess Adventure'! Unfortunately it is only available online with Japanese dubbing, but if you skip to 6:30 on this video, you will see Alfred & Henk go at it. A highly familiar opening follows..."
And if that's whetted your appetite for all things televisual, you can check out our index of chess videos here. I've gone twelve correspondence games unbeaten. The last of these to finish was a game concluded just this week in which I was representing Surrey against Hertfordshire. Or, in individual terms, playing against the amiable Hertfordshire FIDE Master Lorin D'Costa. Who, I believe, went to the same school as I did, albeit twenty years later - though he probably doesn't cite that as his claim to fame. Not when you have Lewis Hamilton as a contemporary. Mostly. Still, I'm not sure correspondence chess is as much fun as it used to be before we all had computers. Back in the good old days you could play all sorts of dicky gambits and get away with it through the stupidity of the opponent. My opponents could, anyway. A dozen games unbeaten? It used to be a miracle if I could get through a dozen moves unbeaten. Just the other day I came across a 2001 game Haug-Horton in which my artificial aids were limited to a chess set on the floor of a shared house in Heaton. By the time I'd noticed that 7...Qa5 wasn't clever after all, it was basically over. 6...Nxe4 7. Qg4 Qa5 8. Ne2 f5 9. Qxg7 Rf8 10. Bh6 Rf7 11. Qg8 Ke7 12. f3 1-0 Next! Whether that's better or worse than playing a game that lasts for months or years and losing at the end - I don't know. Probably better. But you wouldn't have the same feeling of stupidity. Chess and Blake's 7 is even better (for evidence see here or here or even here). ... perhaps only Chess and Doctor Who. (Sadly just a link ... the BBC don't want to allow people to embed their YouTube videos for some reason). The entire S&BCC video collection can be found here. My old friend Nigel Short won a game with Black at Wijk Aan Zee using the MacCutcheon, a line I wrote about here and of which I'm very fond. I much prefer it to the Winawer - in the MacCutcheon White usually fails to retain the dark-squared bishop, which I don't want pointing at my king when I've exchanged off my own. I played a correspondence theme tournament not long ago where the MacCutcheon was the featured opening. As far as I could see it was a forced win when I was playing White, though not quite so convincing when I was playing Black. I also like the unusual formations involved in which it's harder than usual for an inexperienced opponent to come up with a coherent plan. Well, it was for me. These days I'm pretty much wedded to the open games, though I sometimes give the French a whirl at correspondence play. I'd probably play it more, were it not for two things. One is that I've never really found a line I liked against the Tarrasch. The other is that despite the absolute flood of opening books that have come onto the market in recent years, there is no current book on the MacCutcheon. Nothing. 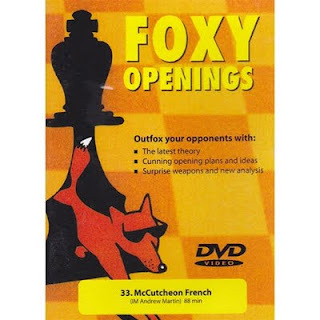 The Chess Direct catalogue lists only the Foxy Openings video produced by Andrew Martin some years ago - which I have - and the US player James Eade's book for 1991, called Remember the MacCutcheon. Apparently, nobody does. Now there's decent introductory coverage in Byron Jacobs' Everyman French Classical and of course there's a chapter or two in Lev Psakhis' Batsford French 3.Nc3. But nothing particular: nothing bespoke. Nothing, as far as I can see, in preparation, and nothing, as far as I can see, produced in the past. Nothing now, nothing ever. Reduced to a footnote in the trivia notes to a page about whisky in the trivia notes to Lost. So what's wrong with the MacCutcheon? Nothing, so far as I can see: nothing obvious, nothing proven, at any rate, even if it doesn't get played a lot at the very highest level. There's no line that I'm aware of against which the MacCutcheon is seen to be badly struggling, which is not always something that can be said of the Alekhine, the Pirc or the Modern Benoni or the Chigorin. And yet the books on those openings continue to be written and continue to be bought. It's odd. A good thing, in a way - where's there are books there is theory and where there is theory there is discussion. Nobody really seems to know the best way to proceed against it, which is what I want. But still, when you're in trouble you need a friend and when you lose a game in the opening you sometimes need a book to help you find out why. But the MacCutcheon doesn't seem to have any friends. None close enough to write its story. Poor, forgotten MacCutcheon.